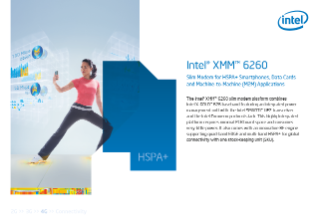 Intel® XMM™ 6260 slim modem for HSPA+ smartphones, data cards and machine-to-machine (M2M) applications HSPA+. The Intel® XMM™ 6260 slim modem platform combines Intel® X-GOLD™ 626 baseband featuring an integrated power management unit with the Intel® SMARTi™ UE2 transceiver and the Intel® Comneon protocol stack. This highly integrated platform requires minimal PCB ...board space and consumes very little power. It also comes with an innovative RF engine supporting quad-band EDGE and multi-band HSPA+ for global connectivity with one stock-keeping unit (SKU). There are more bands in less space switching from a 4-band slim modem for HSPA to a multiband HSPA+ platform on a much more compact PCB footprint.